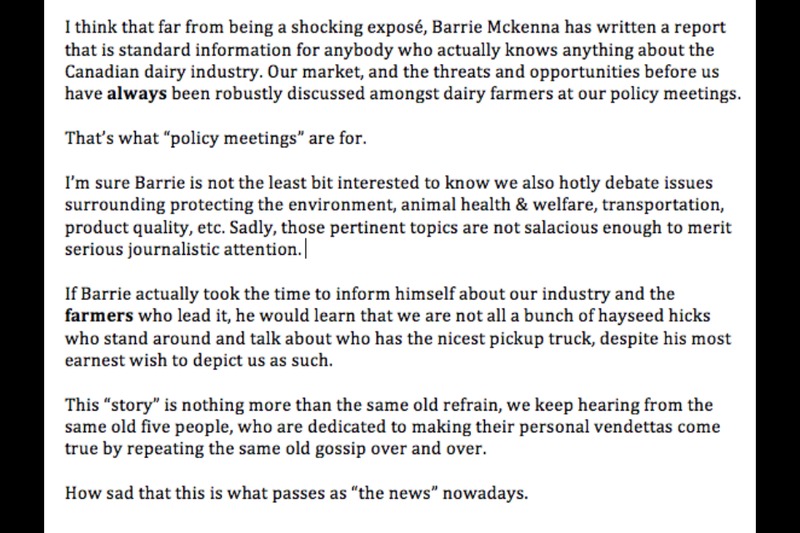 When I first read McKenna’s article I thought he was showing concern for the dairy industry in Canada. I’m not sure what his motives are. However, it seems like outside forces are at play here that the average family farmer has no control over. I would find it frightening as a business owner to be supplying a market that is almost completely out of my own control. All it takes is for the government to remove its protection and your market would evaporate in a day. I’m interested to know if you or other farmers ever plan for that fateful day which could possibly happen or if you simply believe that it never will? Is there some kind of succession or transition plan that could help farmers to shelter themselves from the worst possible outcome. For the large corporate farms it would probably mean getting vertically integrated, buying out many of the smaller farms and competing on the world market. I think there could also be a good opportunity for some of the more resilient small family farms to have a good income as well by focusing on farm-direct sales and specialty or value added products. What are your thoughts on this? BTW nice blog. I really enjoy reading your articles. Mr. Mckenna has a history of writing anti-supply management articles. I’m not sure if he means to incite fear among dairy farmers or to sway the general public’s support with these opinion pieces. However, the picture is not as dire as he claims it to be. Government officials continue to voice their support of supply management. They know that the dairy and poultry industries are vibrant, strong, and are contributors to Canada’s economic welfare. Of course, as farmers, we know that “fateful day” could happen, as it has in Europe. However, such a process would take years, and there would likely be a process involved to help farmers transition. For the present, we’ll continue to farm with confidence, knowing that our system is a good one and that our government realizes this and supports us. 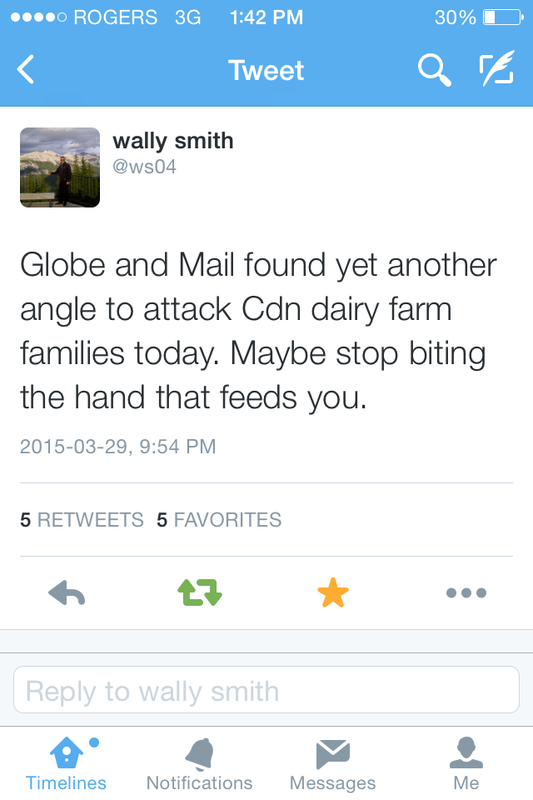 I agree with your outlook for the dairy industry should supply management fail. As organic farmers fillling a more niche-type market, I believe we would stand a better chance of being able to succeed while farming in the same way we do now in that type of environment. But let’s hope that we’ll never see the day when those beliefs are tested! Barrie McKenna is very irritating. He probably thinks he is succeeding because dairy farmers are up in arms over his anti-supply management articles. The other side to his viewpoints never appear in his articles, like subsidized international markets, and definitely plays off of a naive audience that doesn’t understand the quota system. Supply management is a good, fair system. But like the current need to change how its products are priced I believe it needs reform to other policies as times change. 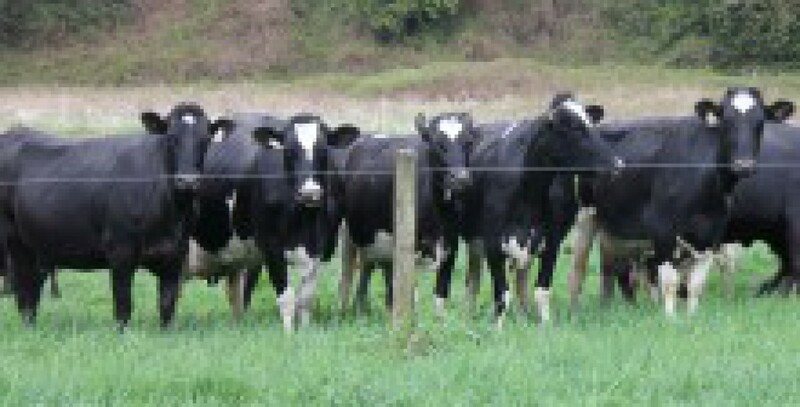 I’m a young dairy enthusiast and have many friends that are as well. We work on farms, even manage farms, but don’t own one and the possibility of this changing isn’t great. I understand how the different provinces have differing entry programs for people like myself. Without financial assistance from other people most of these programs are still very difficult for a new entrant. My thoughts are that in todays market where existing farmers are receiving large increases could not more be done to start more new people into the industry? I’m not going to go as far as McKenna and labelling all dairy farmers greedy but I have come across many in my area that are. Dairy farmers trying to enter the chicken lottery! Farmers telling me the GEP should be scrapped because why should they give me free quota?! Farmers saying their marketing is the reason for the increase in demand for butter so why should they only get 9.5% increase in quota and 0.5% go to new entrants (a suggestion of mine) instead of the full 10%?! I am fully aware that many don’t think like this but unfortunately many of your peers do. This type of attitude is what drives the SM critics. This industry needs new blood. The number of farms is decreasing. The size of farms is rapidly increasing which goes against the ‘small, family run’ dairy farm the Canadian dairy industry is advertising. In a time where BC received a 10% increase in quota a grand total of 5 ‘new’ entrants were invited into the industry. Only a few exceptions that made alot of money in another industry do not need help to get into this industry. If you weren’t handed a farm by your parents, had family members give large financial contributions to help you get started, or used an entry program you have little to no chance to succeed. I believe a little more could be done by the industry to help new people into the industry. It’s in their best interest because Canada is trending further and further away from the small family run farm that appeals to the consumer. I just want people in the industry to understand how it us for those longing to be in the industry. Our oppurtunities aren’t many or overly encouraging and the attitudes of many in the industry leave us frustrated. We give up stat pay, overtime pay, and a better wage in a different industry for the love of the job. It’s not like farmers couldn’t afford to pay us more! Again, you’ve voiced our thoughts on this perfectly! I’d really like to meet you someday; if you see us at an event, please introduce yourself, it’s always great to connect with likeminded people. I’m horrified at the responses you have had to your ideas on the new entrant program. As farmers new to the industry ourselves, we’d love to have more “new blood”. Sometimes it can feel a bit like an old boys club. We actually were just discussing the idea of part of the allotment going to new entrants – I certainly think it’s good idea! From recent discussions with certain board members, I think you can look forward to an improved system once this whole double dipping mess is sorted out. At least, that was the impression I got – they seem to want to make the program better and more feasible for new entrants. Just as an aside: at the recent spring producers meeting we spoke to a bigger producer (700ish) and he actually said he’d like to see five small farms on his road, not just one big one. He’s planning to split his cows & quota between his children someday. Mega farms are definitely not in the industry’s best interest, it was nice to hear this from a bigger farmer!